Carbon nanotubes have unique multifunctional properties. In addition to having high stiffness and strength, carbon nanotubes have exceptional electrical and thermal properties. Carbon nanotubes can also have extremely high aspect ratios (length/diameter), making them attractive as reinforcement for polymer composites. If the large aspect ratio of the carbon nanotube is maintained during the dispersion process, carbon nanotubes can form electrically conductive networks in an insulating polymer matrix at extremely low nanotube concentrations. When deformed, there is direct coupling between the mechanical and electrical response. If the nanotube composite is strained in axial tension the measured DC resistivity changes much more than one would expect based on a physical change in the specimen dimensions alone (axial change in length and Poisson contraction). The conductivity of the carbon nanotube network is dominated by the contact resistance between the individual carbon nanotubes in the percolating network. As the material is strained in tension, the electrical tunneling gaps between the carbon nanotubes in the network are increased. This change in the tunneling gap increases the tube/tube contact resistance and subsequently results in a large measured change in the electrical resistance. In the final stages, if cracks form, the tunneling gaps are cut-off and can be utilized to estimate permanent damage. We plan to expand upon this piezoresistive nanotube based sensing concept and study the novel implementation of these materials as sensors in structural applications. 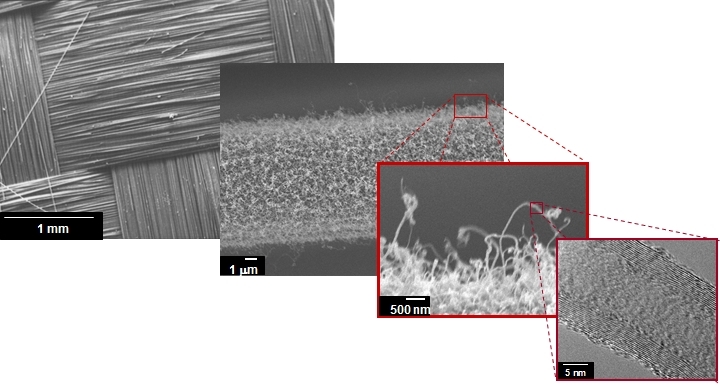 Through judicious material selection and selective local integration of nanotubes we will study hierarchical sensing approaches where nanotube composites can be applied to existing structures to detect the deformation and damage ex-situ or integrated in new structures to sense in-situ.